Do they rattle when you apply the brake while coming to a stop? Does the brake pedal feel softer than it used to? Do you see the brake light on your dash come on when you make a turn? Bring your car to Lansdale Automotive and let us have a look at your brakes. You won’t believe the number of times people go for the $99.00 brake job and end up spending over $200.00 on unnecessary parts. 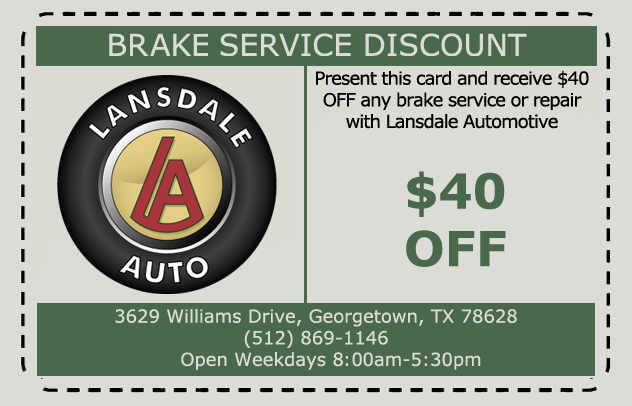 At Lansdale Automotive you won’t get upsells, you’ll just get your brakes fixed right! That’s one of the reasons why we are one of the oldest auto repair facilities in Georgetown! Print off the coupon below and bring it in for an immediate discount on your brake repair.